The Wabash Railroad takes its name from the Wabash River. The Wabash is a 475-mile (764 km)-long river in the eastern United States that flows southwest from northwest Ohio near Fort Recovery, Ohio across northern Indiana to Illinois where it forms the southern portion of the Illinois Indiana border before draining into the Ohio River. “Wabash” is an English spelling of the French name for the river, “Ouabache.” French traders named the river after the native Miami tribe’s word for the river. 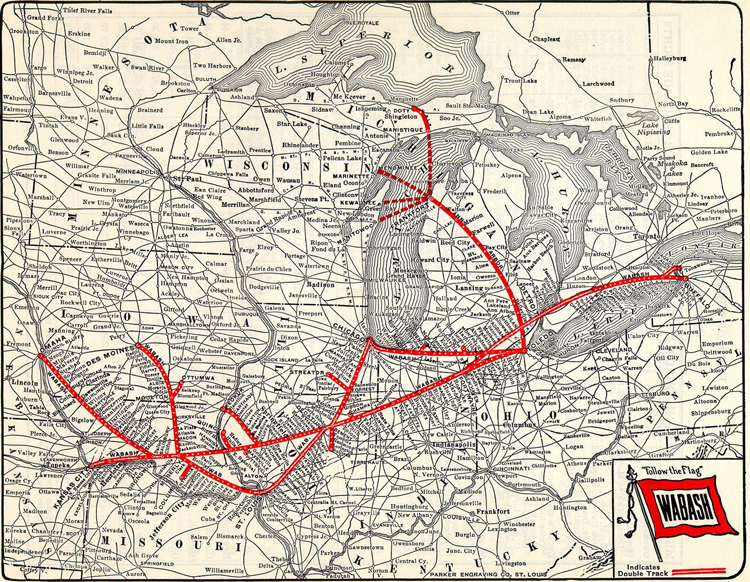 At the end of 1960 Wabash operated 2,423 miles of road on 4,311 miles of track through Ohio, Indiana, Illinois, Iowa, Michigan, Missouri, and Ontario (see map). Sources: The Wabash Railroad Historical Society and Wikipedia.